In life, some people spend year’s working their way up the ladder to reach the highest rungs. Others soar to the top, as if sprung from ground level by a superfluous sling shot. You can probably guess which route 36 year old Ofer ‘Zvi’ Stern took when he became the second native of Israel to make the World Series of Poker’s elite November Nine. Zvi has been dabbling in live poker tournaments for quite some time now, and doesn’t appear to be lacking in the bankroll department. On paper, however, he’s one of the least experienced poker players to make the 2015 WSOP Main Event final table. Stern has just two documented live event cashes to his name, totaling $49,595 in winnings. The vast majority of that came from an 8-handed, $25k High Roller event at the 2015 PokerStars Caribbean Adventure (PCA), where Zvi finished in 34th for $44,540. Prior to that, his only known cash earned him $5,055 for a 63rd placement in a $1,500 Limit Holdem Shootout at the 2008 WSOP. Born in Herzylia, Isreal, Stern currently hangs his hat in the Zamat region of Tel Aviv. When he’s not home, Zvi spends much of his time traversing the globe in search of moderate to high stakes poker tournaments. Despite his lack of success on the felt up to now, the Israeli poker player did manage to draw a great deal of attention to himself throughout the first 7 days of WSOP Main Event action. 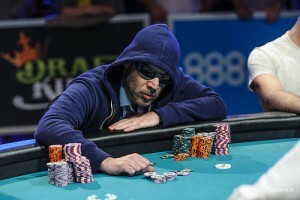 Stern usually sported a dark hoody and black sunglasses at the tables, reminiscent of 2010 WSOP bracelet winner Phil “Unabomber” Laak, helping him stand out from the masses. Not all of the attention afforded Zvi was positive, though. Many of his opponents became irritated by the 36 year old’s propensity to loiter in the tank. Every once in a while, though, his passive nature would turn to super aggression. It was scenarios such at these that catapulted the Israeli poker player into the position of second highest chip stack going into the 2015 WSOP November Nine. Zvi is only the second Israeli born poker player to make the elite November Nine, and is well on his way to following in (or perhaps exceeding) the footsteps of his sole predecessor, Amir Lehavot. In 2013, Lehavot entered the WSOP’s November Nine in the exact same spot—second highest chip stack—finishing the world’s most prestigious event in 3rd place for over $3.7 million. Stern will have his work cut out for him come November. The current chip leader, Joe McKeehen, has more than twice the stack of Zvi with 63,100,000, not to mention a plethora of cashes (85 to be exact) totaling nearly $2 million under his belt. In fact, most of this year’s November Niners have a stronger resume than Stern, but after overcoming a field of 6,420 to make it this far, it’s become quite obvious that—experience or no—Zvi Stern knows exactly what he’s doing at the poker table.